McDonald's McRib Is Coming Back! McRib fans, rejoice! The ever-elusive limited time offering is coming back again. Get it while you can! Available at select locations, the sandwich is making its debut in most McDonald's restaurants in early November, though the exact date is going to depend on where you live, notes Business Insider. New York, Texas and Oklahoma, for instance, have already released the barbecue-inspired sandwich, while other spots -- such as Southern California -- will start selling it on Nov. 2. 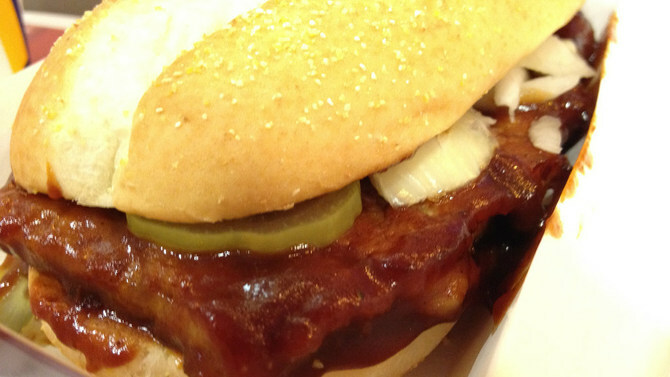 Hawaii's McRib will come out on Nov. 9. So what exactly is behind the cult favorite's intermittent appearances? "There's a lot of mystery around why the McRib comes and goes, but to be honest it's a local option based on consumer demand," McDonald's tweeted. According to Business Insider, releasing the sandwich for short periods of time is optimal for sales. This is because it's easy to create hype around the McRib's reappearances with campaigns like Save The McRib, which in turn draws in all sorts of customers, whether they are McRib fans or not. Plus, there's no guarantee that it will continue to sell well once the buzz dies down, making it optimal to swap out in favor of other novelty offerings. Still, there's no question that the sandwich, which first launched in 1985, has its share of loyal followers, like Xanthe Pajarillo, a woman from Santa Clarita, California, who went to her city council in 2015 to urge them to help her get the McRib back, notes the Los Angeles Times. "The removal of the McRib from the menu has affected my family because every Thanksgiving my family would order a 50-piece Chicken McNugget and 10 McRibs," Pajarillo, who also wrote a song about her woes, told city officials at the time. "It was a tradition in our family, and now it's like my family holiday spirit is messed up and broken. To me, Thanksgiving for my family without this McRib is like a Christmas without snow."